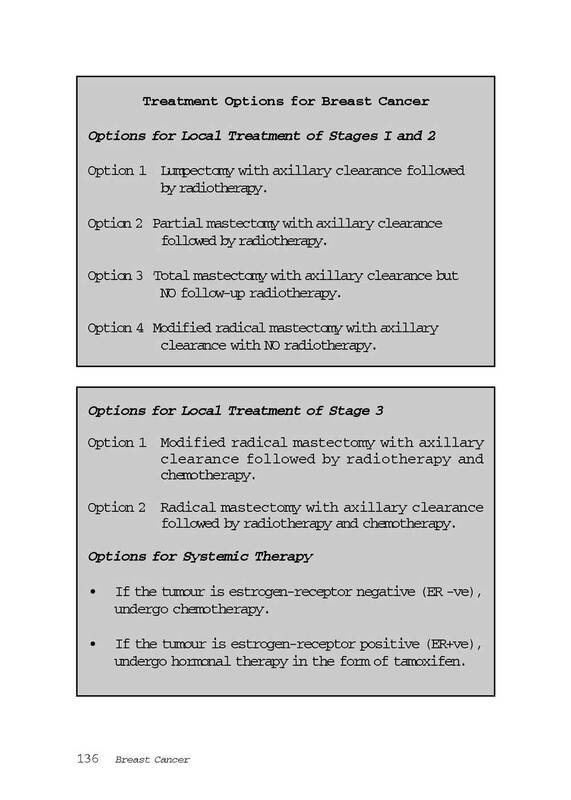 The truth that every common woman and her husband, sons or daughters see is simply this: Can surgery, chemotherapy and radiotherapy cure breast cancer? If they can, what is the cure rate? These people want nothing but a simple, clear-cut down-to-earth answer: the chances of cure. Where is that simple truth? In Chapter 10 of this book, the author plead for truth . . . readers learn the many different versions of “truths” – the drug company’s truth, the doctor’s’ truth and the patient’s truth. . . . these parties do not talk the same language . . . when a tumour shrinks, the doctor understands is as response, while the patients actually seek a permanent cure. . . . It is not the author’s desire to try to prove which medical system is better or who is wrong and who is right. His mission is to help those who need help. There are many things to learn about cancer treatments – that is, if we are prepared to open our eyes to see and not close our ears to hear. Women are mothers of mankind. Through their undivided love, care and devotion, they nurture men and women to make what this world is like today. Even with this heavy responsibility, we have managed to build a nation of mankind. A mother’s love knows no bounds and has kept families intact throughout the ages. Unfortunately, women have added burden of often being inflicted with breast cancer, which, according to statistics has one of the highest rates of the known cancers. Therefore, I feel it is most commendable and timely that this book is written. I wish to congratulate Dr. Chris K. H. Teo for putting so much effort into writing this book. 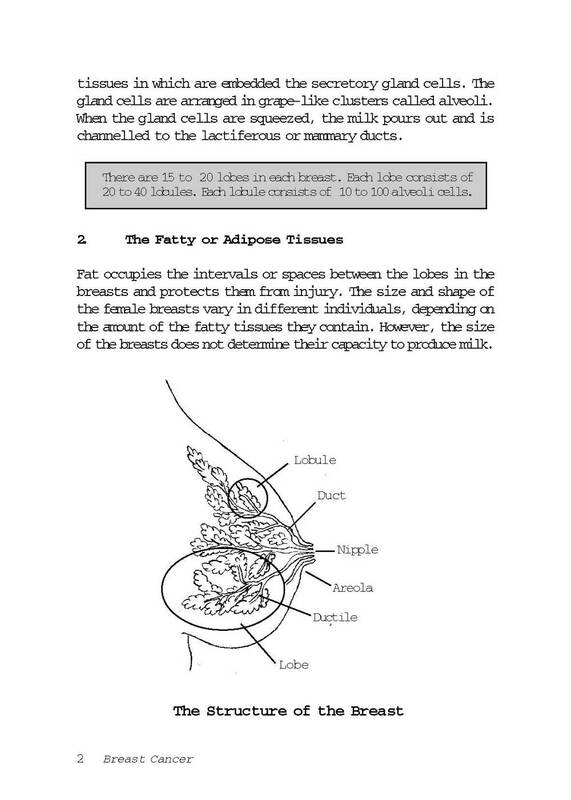 I am happy to note that he has devoted a section discussing ways to prevent breast cancer. I hope the information contained in this book can, in many ways, help people who are in need. Let us all learn to cultivate a happy, stress-free and healthy lifestyle. So not wait until we get sick before realizing that health is important. As mothers, we owe it to ourselves and our love ones to stay healthy. In this way, our family remains intact and happy. Indeed, every sincere and genuine effort made by any person who tries to help his/her fellowmen deserves attention, encouragement and support. The task is even nobler if such devotion and services are extended to all people in need, irrespective of race, religion, social status and material rewards. I have come to know the work of Dr. Teo and his CA Care and found it to be most commendable and deserving of congratulations. I hope this good work to serve humanity will continue for many more years to come. Kebawah Duli Yang Maha Mulia Tuanku Hajah Bahiyah binti Almarhum Tuanku Abdul Rahman, DK., DKH., DMN., DK. (Johor), DK. (Negeri Sembilan), SPMK. YABhg. Datuk Amar Puan Sri Dr. Laila Taib Ph.D.(Hon), Kuching, Sarawak, Malaysia. At the beginning of this 21st century, holistic healing, including alternative cures, particularly of breast cancer, should be adopted by our medical profession. The retraining of medical doctors in such holistic healing is available in several western and eastern countries. I has been practiced inChina for many, many years. 1) Read and gather as much existing information as possible. Review them with an open mind – objectively, impartially and critically. 2) Analyse and synthesise the information. 3) Evaluate what you have learnt against what is currently being done. 4) Propose a hypothesis or a statement of belief based on what you have learnt. 5) Test the hypothesis; in other words, action is needed.
. . . 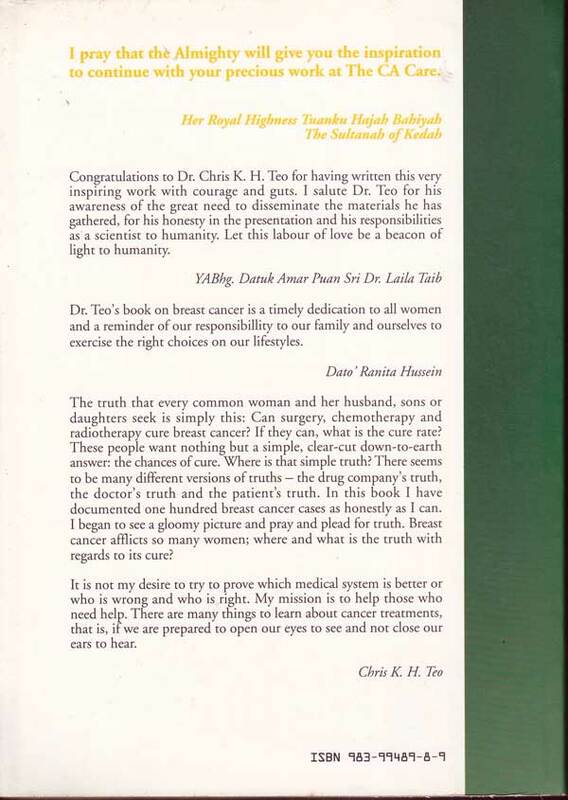 I am very confident that Dr. Chris K. H. Teo’s book, Breast Cancer: Perspective of Medical Science and Holistic Healing is a very valuable contribution to the mass of literature that is already available on this subject.
. . . Everyone interested in the medical profession and women everywhere, should be encouraged to read this book, . .
. . . 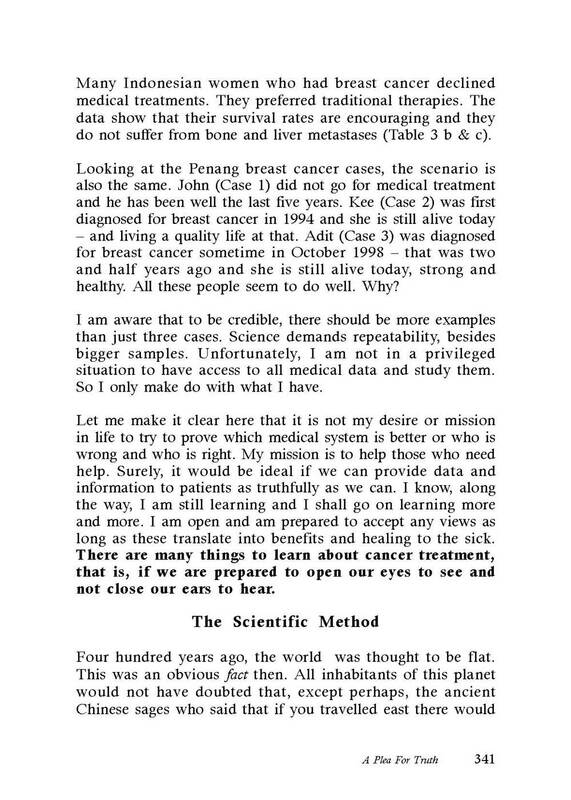 I salute Dr. Chris K. H. Teo for his awareness of the treat need to disseminate the materials he has gathered, for his honesty in the presentation, and his responsibilities as a scientist, to humanity. Let this labour of love be a beacon of light to humanity. From Dato’ Ranita Hussein, Penang, Malaysia. We are faced with many choices everyday of our lives, but we hardly think about the direction that our lives take due to the choices we make. Yet, how different it all becomes when choices have to be made in life-threatening situations such as when one is diagnosed with a serious illness like cancer. . . . 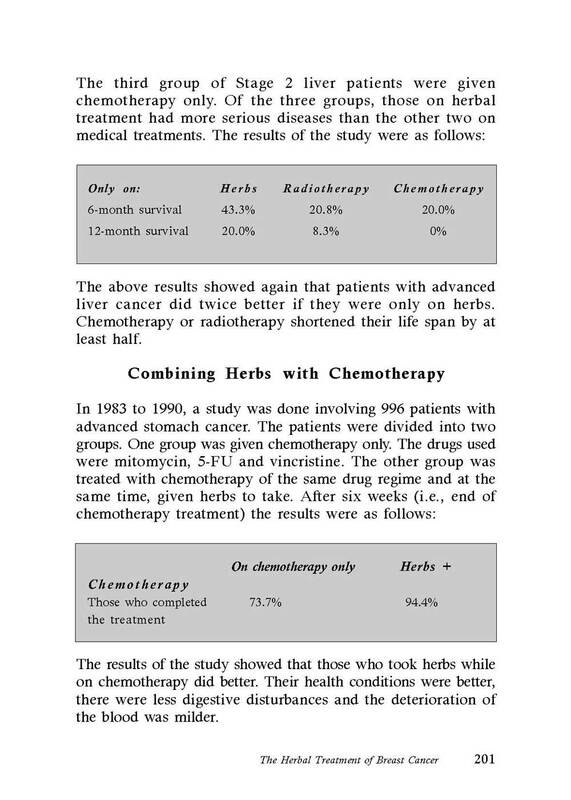 The causes and treatment of cancer remain varied and moot even to this day. For this reason, anyone suffering from the disease owes it to himself/herself to be armed with as much information as possible before deciding on which treatment he/she feels is most suitable for his/her particular condition. 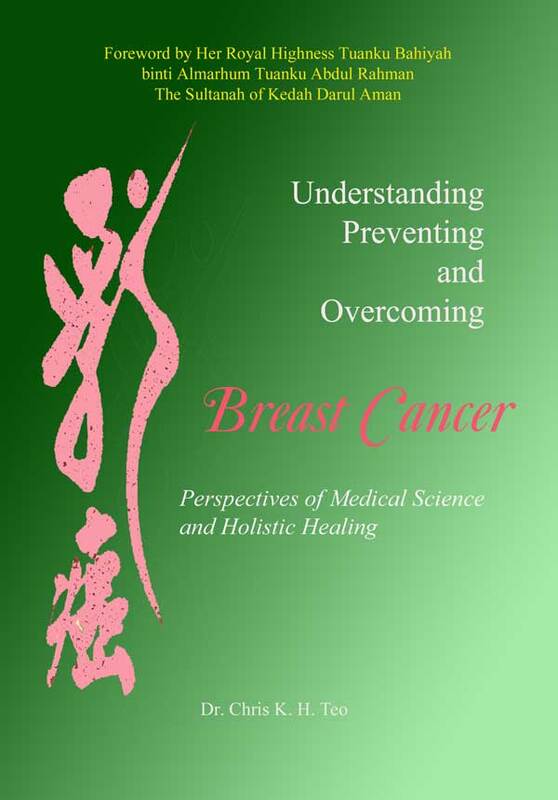 In this regard, Dr. Teo’s discussion in his book on the perspectives of medical science and holistic healing is a caring and useful contribution towards a better understanding of breast cancer and the different methods of treating it.